Looking for interpreting or translation resources? Learn more about KOM’s interpreting or translation fee-for-service. ကညီကရၢမံၣ်နံၣ်စိထၣ် ဒုးဘၣ်ထွဲပှၤဘၣ်ကီဘၣ်ခဲဒီး ပှၤဂ့ၢ်ဝီတၢ်တိစၢၤမၤစၢၤဝဲၤလီၢ်တဖၣ်ဒီး တၢ်ဟူးတၢ်ဂဲၤ အကလုာ်ကလုာ်ဒ်သိးအဝဲသ့ၣ်အတၢ်ဘၣ်ထွဲဒီးပှၤတဝၢကဂ့ၤထီၣ်အဂီၢ်န့ၣ်လီၤ. ကညီကရၢမံၣ်နံၣ်စိထၣ် ပှၤဂ့ၢ်ဝီ တၢ်ဖံးတၢ်မၤပှၤရဲၣ်ကျဲၤတၢ်တဖၣ် မၤစၢၤပှၤဘၣ်ကီဘၣ်ခဲဘၣ်ဃး တၢ်ဃုဟံၣ်ဃီ, တၢ်ဒိးသိလ့ၣ် ဘၢး(စ်) တၢ်သိၣ်လိ, ဟံၣ်ပူၤဃီပူၤတၢ်ဂ့ၢ်ကီတဖၣ်, ဒီးတၢ်အဂၤသ့ၣ်တဖၣ် အါမးန့ၣ်လီၤ. ကညီကရၢမံၣ်နံၣ်စိထၣ် ရဲၣ်ကျဲၤစ့ၢ်ကီးတၢ်ဟူးတၢ်ဂဲၤလၢ ပှၤပိာ်မုၣ်လၢအထါထၣ်သ့ၣ်တဖၣ် ဒီးအပှၤသးပှၢ်သ့ၣ်တဖၣ်အဂီၢ်န့ၣ်လီၤ. ပှၤဘၣ်ကီဘၣ်ခဲအပှၤဂ့ၢ်ဝီတၢ်တိစၢၤမၤစၢၤအတၢ်ရဲၣ်တၢ်ကျဲၤ (RSS) ဒုးဘၣ်ထွဲပှၤဘၣ်ကီဘၣ်ခဲဒီး ပှၤတဝၢတၢ်တိစၢၤမၤစၢၤအတၢ်ရဲၣ်တၢ်ကျဲၤအကလုာ်အလုာ် ဒ်သိးကမၤစၢၤပှၤဘၣ်ကီဘၣ်ခဲသ့ၣ်တဖၣ် ကဒိးန့ၢ်ဂံၢ်ခီၣ်ထံးအတၢ်လိၣ်ဘၣ်သ့ၣ်တဖၣ်ဒီး ကနုာ်လီၤပာ်ဃုာ်လၢပှၤတဝၢအပူၤ ဒ်ပှၤတဝၢတဖုအသိး န့ၣ်လီၤ. ပှၤသူၣ်က့သးပှၢ်တၢ်ရဲၣ်တၢ်ကျဲၤ (Elders Program) ဟ့ၣ်နီၤလီၤတၢ်တိစၢၤမၤစၢၤအကျိၤအကွာ်ဒီး ကရူၢ်တၢ်ဟူး တၢ်ဂဲၤတဖၣ် ဆူပှၤဘၣ်ကီဘၣ်ခဲတဂၤစုာ်စုာ်အအိၣ် ဒ်သိးကမၤစၢၤပှၤသူၣ်က့သးပှၢ်သ့ၣ်တဖၣ် လၢကအိၣ်ဒီးတၢ်ဟူးတၢ်ဂဲၤ, ကအိၣ်ဒီးတၢ်ရ့လိာ်ဘၣ်ထွဲလိာ်သး, ဒီးကသ့ပၢဆှၢလီၤအသးဒၣ်ဝဲအဂီၢ် န့ၣ်လီၤ. ဟံၣ်ဖိဃီဖိပှၤတိစၢၤမၤစၢၤတၢ်အတၢ်ရဲၣ်တၢ်ကျဲၤနီၤဟ့ၣ်လီၤတၢ်မၤစၢၤအကျိာ်အကွာ်တဖၣ်,တၢ်ကူၣ်ဘၣ်ကူၣ်သ့, ဒီးတိစၢၤမၤစၢၤလၢပှၤ ဘၣ်ကီဘၣ်ခဲသ့ၣ်တဖၣ်ဒ်သိးကသူၣ်ထီၣ် တၢ်ဆီဟံၣ်ဆီဃီဒီးဟံၣ်ဖိဃီဖိလၢ အိၣ်စံာ်အိၣ်ကျၢၤ လၢပှၤတဝၢပူၤကသ့အဂီၢ်န့ၣ်လီၤ. တၢ်ထါထၣ်တၢ်ရဲၣ်တၢ်ကျဲၤဟ့ၣ်တၢ်ခွဲးတၢ်ယာ်ဒ်သိး ပှၤဘၣ်ကီဘၣ်ခဲသ့ၣ်တဖၣ် ကမၤဖျါထီၣ်က့ၤ, ပၢၤဃာ်ကတီၤက့ၤဒီး ကဟ့ၣ်နီၤလီၤကညီဖိတၢ်ထါထၣ်တၢ်ဆဲးတၢ်လၤလုၢ်လၢ်ထူသနူအဂီၢ်န့ၣ်လီၤ. KOM connects refugees with social services and activities to keep them engaged in the community. KOM social service coordinators assist refugees with housing, bus training, family issues, and more. KOM also facilitate activities for women who weave and seniors. The Refugee Social Services (RSS) program connects refugees with a variety of social services to help refugees meet their basic needs and integrate into the community. 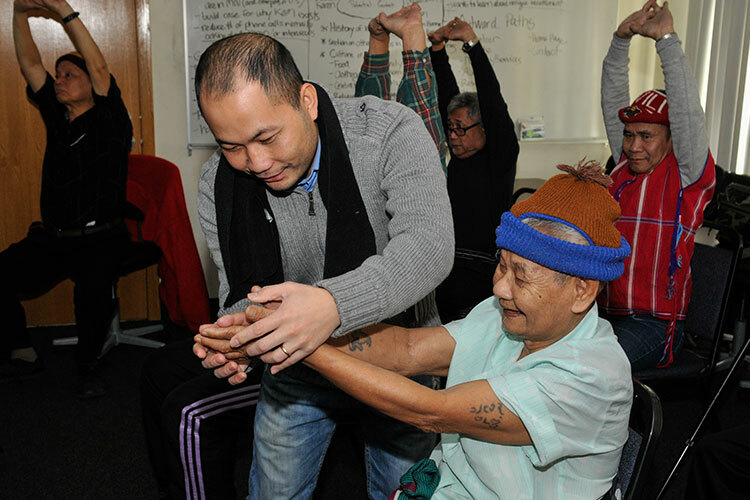 The Elders Program provides individual case management and group activities to refugees to help seniors stay active, connected, and independent. The Family Advocate provides case management, education, and advocacy to refugees to help build strong marriages and families within the Karen community. The Weaving Circle gives refugees the opportunity to revive, maintain, and pass on traditional Karen weaving. To learn more about RSS and the Family Advocate, contact Morrison Johnny, RSS & Family Advocate Program Manager. Contact Moses Moe, Weaving Circle & Elders Program Manager, to learn more about the Elders Program and the Weaving Circle.